﻿ Guest house area. Guest house Na Lednicke. Accommodation in apartments. Hlohovec, Moravia, Czech Republic. Located in the heart of UNESCO-protected Lednice-Valtice region in South Moravia, Czech Republic, guest house Na Lednicke is just 80 km away from Vienna, 100 km from Bratislava and 60 km from Brno. The guest house is situated outside Hlohovec Village between the castles of Lednice and Valtice. Five terraced single-storeyed apartments (each with its own entrance) and a detached cottage for a group of friends are at your disposal. We have seven apartments in total, the ultimate capacity is 28 guests. All apartments have a fully-equipped kitchen, essential utensils are provided. The rooms are quiet and comfortable and have peaceful rural views of fields and woods. This new but well-established guesthouse launched in 2009 features a playground with a trampoline and a petanque terrain. We provide on-site parking facilities and Wi-Fi access in all rooms free of charge. Our guests can enjoy local Moravian and other European wines from our own cellar. Weddings, celebrations and business events can be organized. Car rental. An automatic Renault Megane is available at 50 euros per day. 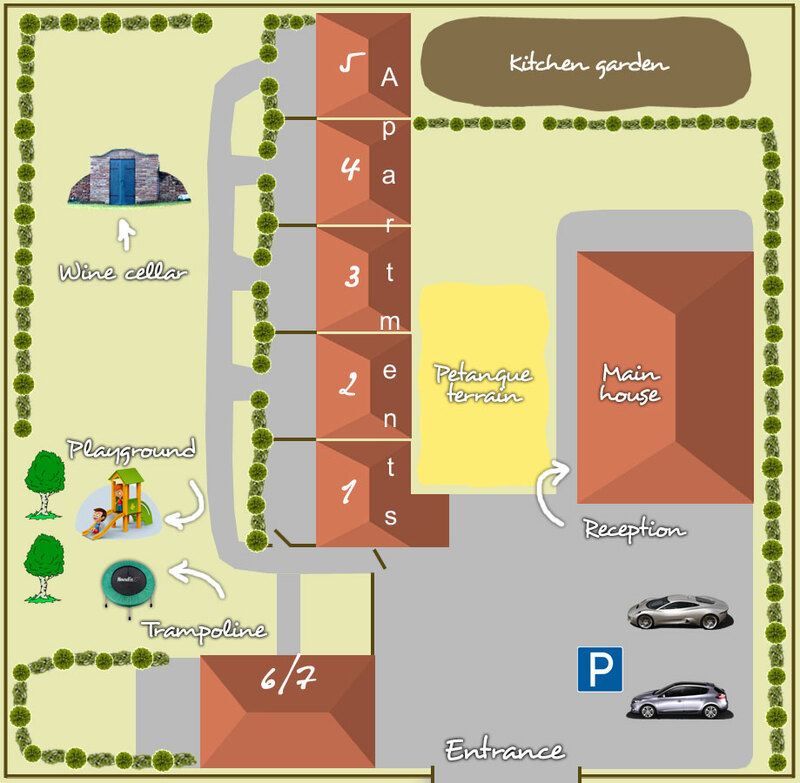 Playground and petanque equipment can be used by all guests free of charge. (c) 2012—2019. Guest House Na Lednicke. Accommodation in apartments. Hlohovec, Moravia, Czech Republic.